In the presence of competition, archerfish become more hesitant but accurate shooters. ABOVE: An archerfish takes aim. While targeting prey with a stream of water, archerfish become reluctant when being watched by other fish. 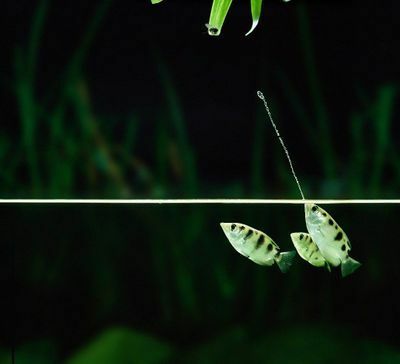 Known for their ability to aim before spraying their victim, archerfish will shift their position several times before lining up their shots. In research published in Animal Behavior on June 15, researchers suggest this social anxiety–induced behavior may help archerfish beat out their competition by increasing their accuracy. “Archerfish may be famous for their shooting ability, but they may be even more remarkable for their capacity for making rapid decisions with high accuracy,” study coauthor Nick Jones, a doctoral student at the University of St. Andrews in the U.K., says in a statement. N.A.R. Jones et al., “Presence of an audience and consistent interindividual differences affect archerfish shooting behaviour,” Anim Behav, doi:10.1016/j.anbehav.2018.04.024, 2018.